This was a major renovation of an existing space. A wall was knocked down to join the kitchen and what had been the dining room. The whole family now enjoys the expanded space. You can read more about this kitchen in the True Stories section and in the Fall 2009 issue of Kitchen Views magazine. 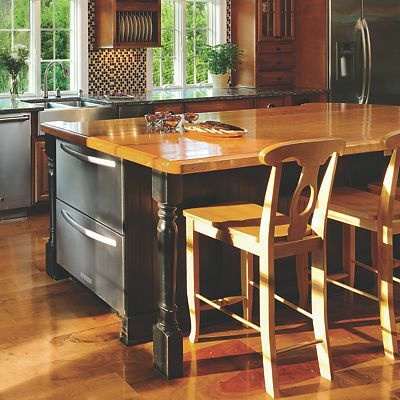 The large island has a custom-made cherry top, adding warmth to family gatherings. Refrigerated drawers keep beverages and snacks handy for the children, and reduce trips to the main refrigerator. Whether doing homework, having a quick snack, or a casual family meal, the island creates the perfect family gathering spot. 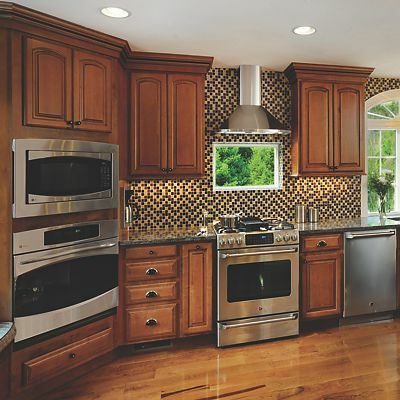 Wall ovens provide additional ways of preparing meals for large family meals or baking when entertaining guests. The stove area includes a range hood for ventilation and an unusual placement of a custom casement window for anyone cooking to enjoy the beautiful view. 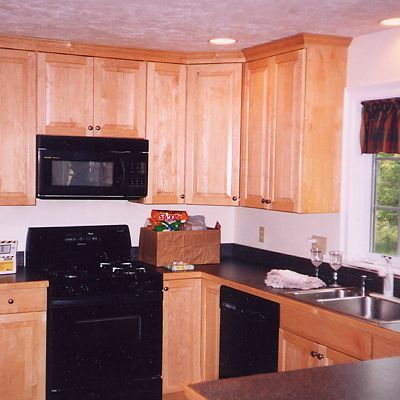 Before, this was an efficient small kitchen with nice cabinetry and appliances. It just wasn't a large enough space for this growing family and their large extended family gatherings. Amy was able to imagine how the space could be better utilized and create the perfect new family-focused living area. The wall with the stove was knocked down to use the combined spaces of the old dining room and the kitchen. The sink was moved to a new location. The results are amazing, with lots of room to grow.